What do you get when you mix saxophone fragments of Webern, Debussy, and Pousseur in one same algorithmic cauldron, in a bucolic park in Turin, Italy? This piece provides one possible answer to that question. 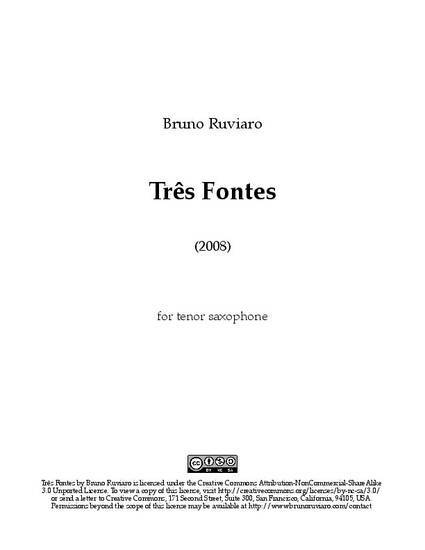 “Três Fontes,” in Portuguese, can be translated as “Three Sources,” but also “Three Fountains.” You are free to use, study, remix, and share this piece. Tenor saxophone solo. Premiered by David Wegehaupt at the Center for New Music Technologies (CNMAT), March 7, 2011. This work is licensed under a Creative Commons Attribution-NonCommercial-ShareAlike 3.0 Unported License.